Quiet navigation, with the safety of a powerful firewall, using only one account with your ISP for all the users on the LAN. Redundant connections in order to obviate to possible inefficiencies of the ISP without stopping working. 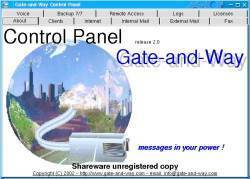 Other modules included on the Gate-and-Way Package are: - MAIL: Powerful and integrated with shared folders and personal folders for internal use only. Authomatic download of mail from the Internet. - FAX: Reliable and automatic, integrated with the e-mail. A unique environment where you can find all the information in the easiest and fastest way. - VOICE: Automatic voice autoresponder. More personalized messages for more hour bands. It Can be turned on/off automatically or manually. - BACKUP 7/7: Each day of the week will have its own online backup, automatically copying the data contained also in the network computers. You will never lose any data due to hard disk crashes either at the server side or at the client one. - REMOTE ACCESS: Password protected remote connections to access the LAN and all the Gate-and-Way services. Imagine "being" at the office while at home, away on business or on vacation. All the modules could be integrated in a unique environment and centrally managed.